With the color selections from 100 colors, it may become a daunting task to choose a color that fits your style. 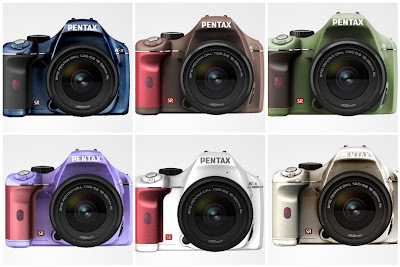 The color selection from Pentax K-x draws a bunch of unfair criticism from the Pentax community and perhaps the outsiders of Pentax community. I don't understand why is there complaints on addition of choices. I always like choices. Pentax or any other companies and retailers will not hold your hands in sticking with the black body that you dearly love. "No black body, no business with me" would be a silly saying as the black color is one of the four default colors in US and I think the majority will still stick with the black color. But why complain on something that Pentax makes in turning its entry level camera interesting with color choices besides the improvements on its features. It is debatable if the color choices is a business risk to take. If I were Pentax, I will start small like 25 colors with some of the limited edition colors hand picked by Hin and try to draw less criticism from the black only and the so-called enthusiasts and the black-only professionals who treat any change from the norm as childish, teenage and not a good idea. Perhaps, the toy and carton animation like color edition draws the most criticism but people should note that Pentax plans for 100 limited order for this type of color. My son at 7 was jaw dropping when he sees this camera and I ask him for an honest answer if he wants his Daddy to go for one in Christmas, his answer is a definite NO. But does that make me and my son think less of Pentax, a definite NO for sure. Quite on the contrary, we think more positivelt about Pentax and I feel a proud Daddy to show my son that his Daddy's blog is behind a unique company with bold and out of the box thinking. Guys, nobody ask you to buy this limited editor of Carton like color and I am sure this will simply run as a hot limited edition item similar to the special edition of Pentax K-m in the white edition that only limit to 1000 copies for purchase. Come on, this is just a display for people to pick up in the K-x in store to get the color appeal. It is not the final packaging. At least I don't believe that Pentax will sell a body wrapped in plastic shell without a manual, CD, charger and the accessories that comes in a sturdy box. Please don't jump in conclusion with our USA buyer experience over how Pentax Japan runs its retail business and marketing deployment and realization for "Be interesting." I think if the marketing scheme really catches on with wonderful execution. The Canikon may go back to the drawing board and they may get confused if this color scheme thing takes off in the entry level. Maybe the next entry level from Canikon will go something similar along the same thread of thought in color appeal to color blind the masses who love Canon and Nikon. Each may come up with 101 colors that you can choose in Canikon look alike color schemes for body, hand grip and battery grip. Canon -- you pick any color you want. By the way, the black one will cost you much more. Nikon -- you can pick any color you want except the black one, special order with upgrade fee is optional for Dark Forces version. Wow, the Canon L lens can finally come in color other than white, that would be awesome. And the VR lens come in red to morph into Very Red for the VR acronym, that would be totally fantastic, don't you think? I think it is a bold move from Pentax. It looks so ridiculous that it actually looks pretty. And it looks so trashy that it looks artsy as well. It looks so awful that it looks awesome and tempting. It looks so childish that it looks so creative and with a fresh touch. like a genius design in the making. -- Hin's copyrighted quote for Pentax K-x campaign-- be interesting. Yea I don't understand why people are complaining about the colors... Pentax are not forcing it to buy it those colors; its an option, and a very cool one at that! Think about going to the World Cup next year with a Pentax camera that has the color scheme of your team/jersey! I would still love to get a white one. Instead of the red hand grip, I may just settle with the while and black one that is available in US.